Bad North's description: "minimalistic, real-time tactics roguelite," sounds like it's the latest in the ongoing irritating habit that indie developers have to throw every buzzword they can think of into their descriptions. It's almost always a desperate bid to try and make their game stand out from the deluge of other games doing exactly the same thing. With every buzzword I read, my trepidation in playing that indie title escalates just that little bit more, and I've generally come to the realisation that in most cases those buzzwords are used to hide a startling lack of original thought and inspiration. Thankfully, I'm more than happy to report that Bad North is one of the rare gems. Related reading: Structurally, this Bad North shares a bit in common with FTL. Here's our review of that game. 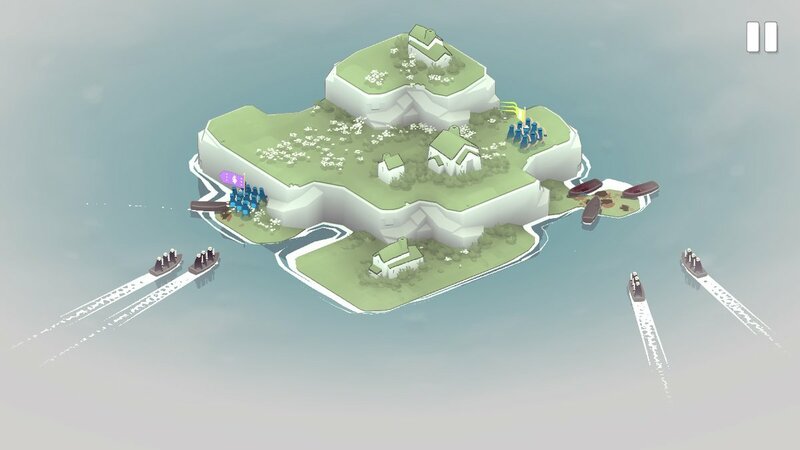 Your goal in Bad North is to protect a series of islands from increasingly aggressive attacks from vikings. These islands are arrayed on a map screen with a dotted line on the back constantly "absorbing" islands, forcing you to constantly push on and fight on more difficult islands. If you've played something like FTL, then you'll be familiar with this system; effectively it means you can't backtrack, and won't be able to visit every island, so you'll need to be strategic about how you chart your course through the levels. Each island offers something a little different. Some might give you additional units to add to your forces. Others have buildings that, if saved from the vikings, yield cash that can be used to increase the power of your units. As with any "roguelike" the layout of maps is randomised, and sometimes you just won't get lucky enough to have any hope of getting through the rapidly escalating difficulty, but overall the game is balanced just right such that if you're clever about what you're doing, you should be able to push deep into the campaign at each attempt. Once you've selected the island to defend, and the forces that you'll use, Bad North shifts to a real-time tactics game. 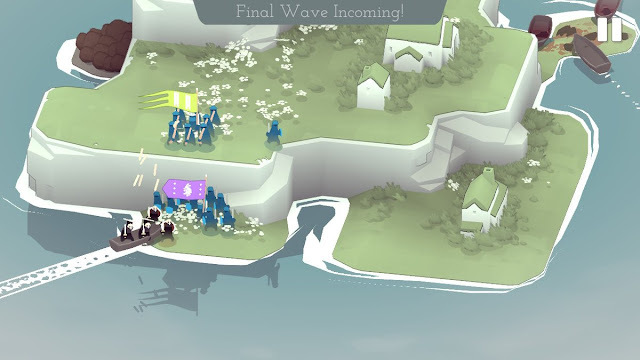 Islands are broken up into "squares" and you direct your units around just as you would in a tactics RPG, but rather than taking turns, the action plays out in real time. This is manageable because time slows right down when you're issuing orders to units, and the islands themselves are small in scale so relatively easy to monitor and move around. 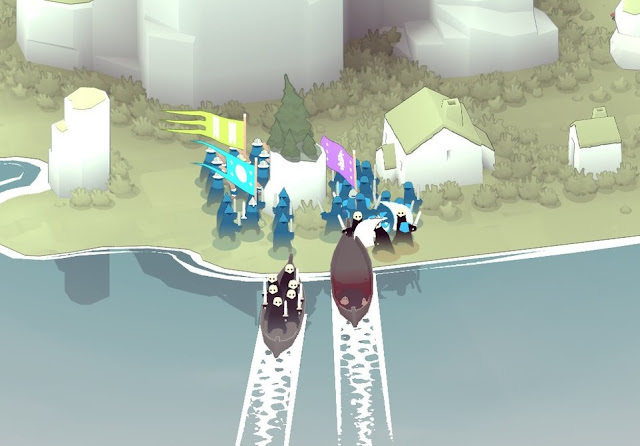 Enemies - the vikings - come in waves on boats, and subtly Bad North inverts the normal order for tactics strategy games in a way that I found to be incredibly appealing. In most cases, in a tactics strategy game, your side is the one that's up against the difficult odds. Traditionally, your opponents are generally the ones positioned in strategically defensible positions that you then need to work out how to overcome. But here, in Bad North, you're the one fighting from high ground. The viking boats come in on trajectories that make it easy to determine exactly where they will land, and you can set up your units to stop them right there at the beach, with minimal loss of life on your side. At least, that's how things are at first. Then enemies start coming in waves from all angles, and even though you're still fighting from the higher ground, suddenly the strategy shifts to figuring out how to best split your forces. Some enemies have shields that mean archers can't shoot them down while they're still on their boats. Other enemies have bows of their own that can decimate the ranks of a ill-prepared unit waiting on the beach for them. For such a minimalist game, the eye for detail is quite impressive. There was one time that I positioned my forces on a beach "square" which had water on three sides. I figured I'd stop the enemy on the thin strip of land before they could reach my archers positioned up the beachhead. But when a boat makes landfall, it actually pushes any soldiers on that square back a bit and then - plop - half my unit was instantly killed by being pushed into the ocean. What initially seems like a very light strategy game indeed doesn't take long to really test your tactical thinking. If the vikings get off the beaches of an island they'll run around burning the buildings on that island until stopped. This is bad for your future fortunes, since it's those buildings that provide the cash required to level up units and ensure they're able to handle the more difficult enemy swarms on future islands. You'll only get the cash if the building is still there at the end of a battle. I will say that this side of the game is perhaps a little too thin for its own good. It would have been nice to have some greater reward from saving houses - some kind of resource to build greater defences while levelling up units, perhaps. And a stronger sense of narrative could have gone a long way in building an emotional engagement in what is going on (and therefore a sense of consequence when things go belly-up). 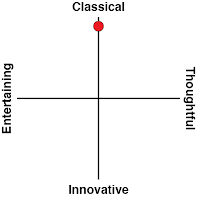 Still, Bad North is quite explicit about its minimalist intent, and it achieves that with style. The game is simply gorgeous to look at, with a mellow use of colour and clean, sharp lines making the action exquisitely elegant to watch play out. The minimalism makes for a simultaneously amusing and stark way of presenting the violence and bloodletting that happens once combat is joined, too. Somehow the action is that much more impactful when colourful little blobs are bursting into a richly coloured crimson. Amazingly the Nintendo Switch has had more than a few light strategy games released in recent weeks: Element and Crush Your Enemies also both aspire to be accessible, simplified, but not unintelligent strategy games. 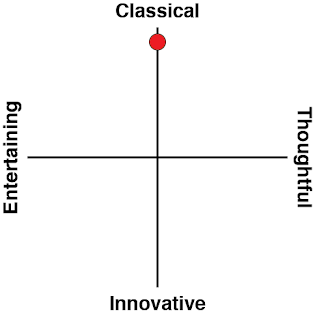 Bad North is leagues ahead of the other two in terms of quality, however. It's a rare example of where the randomisation of the roguelike structure doesn't feel like a lazy excuse to ignore level design. Rather, it provides a canvas to allow some of the cleanest and engaging tactical action that we've seen in quite some time play out.